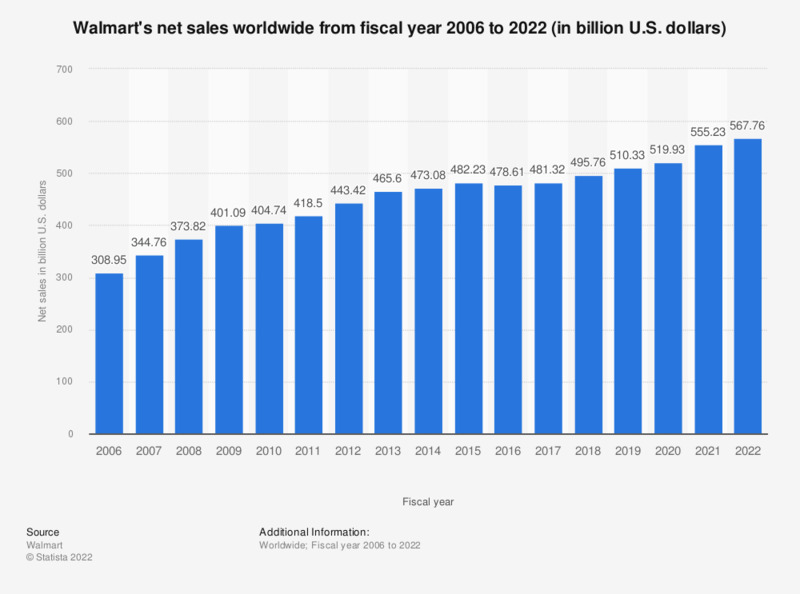 The timeline shows Walmart's net sales worldwide from 2006 to 2019. In 2018, Walmart's global net sales amounted to about 500.34 billion U.S. dollars. In 2017, Wal-Mart operated over eleven thousand stores worldwide; with 4,672 of those stores located in the United States alone. Even though Wal-Mart has been criticized for their low wages, they claim to do a lot of good for lower income households. Figures show that a family can save about one thousand U.S. dollars a year with their ability to cut prices on some products, such as toys, by thirty percent in order to stimulate more sales.